FILE - This photo released on Tuesday, Nov. 17, 2015 by the French Army Communications Audiovisual office (ECPAD) shows a French Rafale jet on the tarmac of an undisclosed air base as part of France's Operation Chammal launched in Sept. 2015 in support of the US-led coalition against the Islamic State group. Support is growing in European Union countries for more military action against the Islamic State group in Syria and Iraq and for security services to be given greater access to personal communications data in order to combat terrorism. Opinion surveys are showing increased backing for tougher action after the recent Paris attacks. Privacy concerns, which were widespread following disclosures about U.S. surveillance programs, are being reevaluated as national security concerns grow. Other polls suggest up to 84 percent of the French are prepared to accept further constraints on personal freedom if needed to combat jihadists in Europe. FILE - French police conduct a control at the French-German border in Strasbourg, France, to check vehicles and verify the identity of travelers as security increases after last Friday's deadly attacks in Paris, Nov. 20, 2015. To see how the shift in European public opinion plays out in political terms, the focus will be on Britain, where Prime Minister David Cameron is likely to ask his country’s parliament Wednesday to approve British military action against ISIS in Syria to complement British bombing raids against the terror group in neighboring Iraq. Two years ago, Cameron suffered a serious blow to his authority, losing a vital parliamentary vote endorsing possible military action against Syrian President Bashar al-Assad's government to deter the regime’s use of chemical weapons. The loss of that vote severely damaged British-U.S. relations. One of Cameron’s arguments for action is that Britain’s allies have asked for assistance. It remains unclear whether Cameron will have enough parliamentary support, although the vote will not be called if the government fears it will lose. Most political analysts suspect he will be able to pull off a victory. But the ruling Conservative Party’s narrow majority in the House of Commons and the opposition of the Labor Party’s new far-left leader Jeremy Corbyn to bombing ISIS in Syria is complicating Cameron’s efforts. 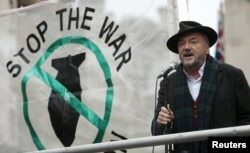 Anti-war activist and former British member of parliament George Galloway speaks at a rally against taking military action against Islamic State in Syria, outside Downing Street in London, Nov. 28, 2015. Recently, the British Parliament's Foreign Affairs Committee issued a report urging caution, saying British airstrikes would be “incoherent” and ineffective without a plan to end Syria's four-year civil war. 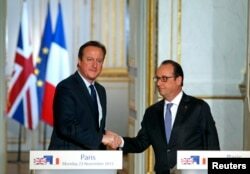 That report was released before the Paris attacks that left 130 people dead and more than 350 injured, but was instrumental in persuading Cameron to drop a plan earlier this month to seek permission for airstrikes on ISIS in Syria. Britain has been one of the most reluctant among Western countries when it comes to military intervention in the Middle East. Skepticism has been high since Britain participated in the 2003 invasion of Iraq and ouster of autocrat Saddam Hussein — an intervention, critics say, based on an intelligence assessment detailing Iraq’s alleged weapons of mass destruction that is believed to have been purposefully distorted by then prime minister Tony Blair. Last week, Britain's government released a 36-page letter, arguing it should act to deny the Islamic State group a “safe haven” in Syria from which to plot mass-casualty attacks around the world. And the British public appears to support this view. According to YouGov, a clear majority of the British support airstrikes on ISIS in Syria. “Public support, now at 59 percent to 20 percent in opposition, has been steady throughout 2015, even in the wake of the Paris attacks, suggesting the public have settled on a position, with support unlikely to deteriorate in the near future,” the pollster says.